Welcome to Comerica Park! This is where the Tigers WANT to be! They play good baseball – HERE! Kansas City Royals, in Motown, on Friday night. – really pitch. Washburn took the game into the eighth inning, before the Royals batters were turned over to Brandon Lyon. 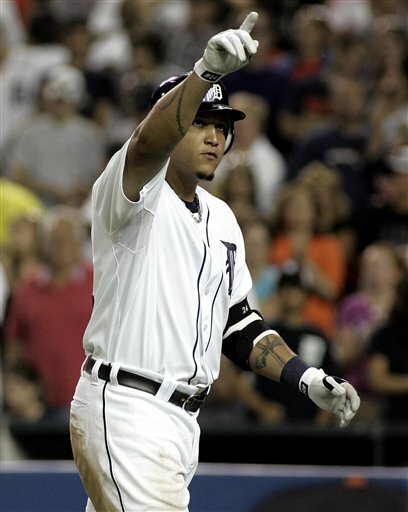 former Tiger Roman Colon allowed; a solo home-run from Brandon Inge. was wonderful to see the Tigers team mob Inge as he crossed the plate. home-runs to the 16 hit mix, and Placido Polanco doubled. Then, on Sunday afternoon, the bats fell silent. Unfortunately, this has become a pattern after multi-run games. settled in; giving up four hits, two earned runs and striking out six. were unable to make it happen in the bottom of the inning. Tigers will face King Felix. Felix Hernandez will undoubtedly be good. he is hot on the road. Rick Porcello’s suspension will end Tuesday, so he’ll get the nod for the Tigers. find out why they fall flat at the plate, when runs are needed most. Central. The Chicago White Sox are two and a half games behind. Today, the Tigers also added to their line-up by acquiring Aubrey Huff from the Baltimore Orioles. It is a great time to be a Detroit Tigers fan. Let’s go! This entry was posted in Dailies and tagged Alex Avila, Brandon Inge, Jarrod Washburn, Justin Verlander, Miguel Cabrera, Placido Polanco, Roman Colon, Roman Santiago, Zach Greinke. Bookmark the permalink.